I used to order electronic parts and read the catalog cover to cover. 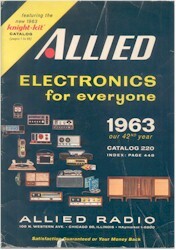 Allied electronics is still very much in business. I received a catalog I requested on their website. It's a much thicker catalog, it has 2224 pages as of the 2013 edition. Right, Bob. 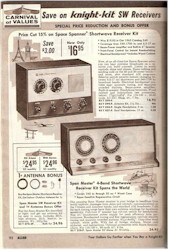 Tandy Corporation (Radio Shack's parent company) bought Allied Radio in 1970, but was forced to sell what was left of it in 1973. According to Wikipedia's "Allied Radio" entry (which reads like marketing propaganda to me), an incarnation of Allied still exists. Didn't they become Radio Shack (or maybe it was Lafayette Electronics)? I remember when Allied Radio was under the Tandy umbrella. Correct me if I'm wrong. Built my first stereo amp from a Knight Kit. I built a Knight-Kit Star Roamer AM/shortwave radio kit ($39.95) from the 1964 Allied catalog; I still have it. Whenever a new annual catalog arrived, I would spend countless hours studying it cover to cover.